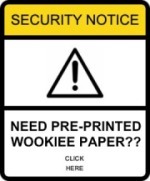 Print your own FORTUNE WOOKIEE PAPER!!!!!! 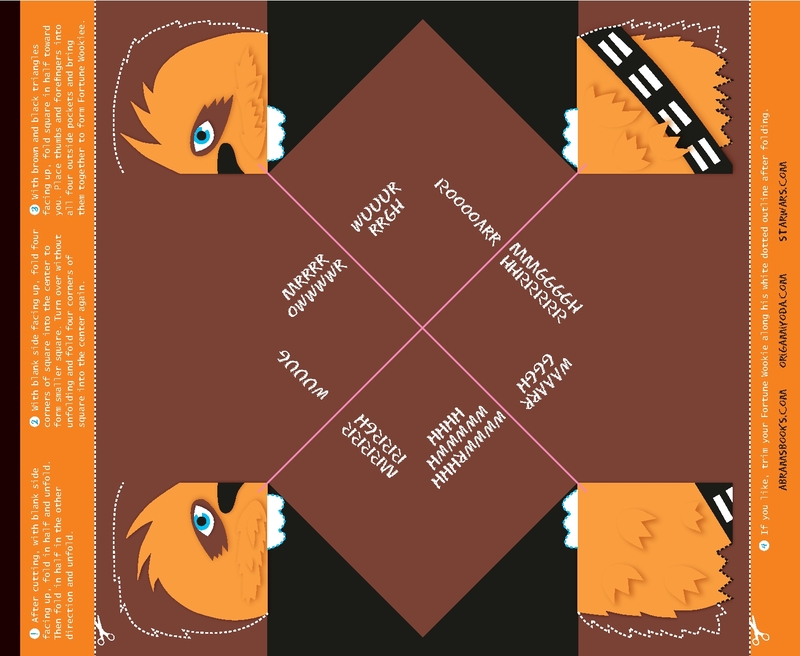 Download and print this picture to make your own Fortune Wookiee paper! Make as much as you want! Have fun!!! Thank you Abrams + Lucasfilm for making this possible! But I already sent out for mine. Will it still come Tom? YES!!!!!!!!! My printer doesnt have color ink, so ill still get it in the mail! I’m still sending in to get one. I already got one, but I lost it. YES!!!! I pre-ordered the book @ Barnes and Noble, but never got the Wookiee paper and didn’t send off for it! Tom, can you please keep this up as a permenant post. My printer is empty right now, so plzz keep this one up. Oh yay i was going to send mine off today but now i can print it off! You got permission then? stooky! I sent in for mine, my printer doesn’t work will it still come? Yes. I asked Tom the same thing. I printed ten, and ate twelve. My first pic I’m going to upload to become a SuperFolder is the Fortune Wookiee and Yoda about to fight Darth Paper! Oh well, i still made it and it looks really good apart from the fact that it is pink. It can be a female Wookiee. Wow, never thought i would find this! YAY!!! hey, tom, i made a pre-print using powerpoint. May I post It? Awesome! :D My dad wont let me use the printer but I think my grandparents will. Right click on the paper, go to microsoft word, right click, select paste on print! Tom. Is this gonna stay on the site? YEAH! It is a post. That is awesome!Now I can print (fold he he) as many cover Fortune Wookies as I want! I wish you could print me a Fortune Wookie because I can’t print in color.You know why?Because my printer doesn’t have the color magenta! hey tom is this gonna stay on the site? how do we print the paper???????????????????????????????????????????????????????????????????????????????????????????? Click on it, it should turn big. Then hit command(apple for Mac) p like command quit but command print. Holly purple this rocks about a month ago i was looking for printable wookie paper but back then you could only get one in the book (hard cover) or order but now i can print it!!!!!!!!! / \ Ps its yoda!! Thanks for telling me i n the e-mail, Tom! I never would have found out otherwise! it is great i helped a lot of pepole…i think? Tom,how did you come up with the idea of a wookie fortune teller? tom how do you get it. EMAIL me the answer! please it is soooooo stooky! Hey Tom, where do I get that Wookie paper at? Is there a website I can find it at? Isn’t it right here on this page? Oh my mistake . Thanks! hey tom thx for the fortune wookie paper. but can u plz try to send in c3po intrutions? also keep clam and dont be a harvey! i love that saying. Since my printers out of ink, Ive been waiting for it in the mail. Just mailed out a whole ton of them today! can u post instructions for darth maul? PLLLEASE? IT JUST CAME IN THE MAIL TODAY! P.S Im the one who sent the cover yoda instructions with it as SF Bryce. The P.S was for Tom. If you want the paper print it or find a sticker on the book. how do you print wookie paper!!!!!!!!!!!!!!!!!!!!!!!!!!!!!!!!!!!!!!!!!!!!!!!!!!!! You should thank Disney. They OWN star wars now. Speaking of, I saw some mickey mouses in Jedi robes when I typed “star wars 7” in google. FREAKING ME OUT!!! 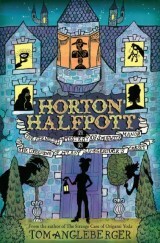 Tom Angleberger is a great writer! He is very funny and creative! heeeyyyy! 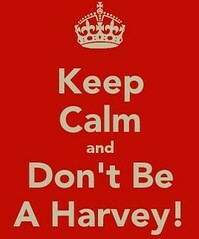 keep calm and don’t be harvey! I got this paper in my book at Barnes&Noble. Computer because my sister is doin homework and my mom is doin you tube while down loading them:(! my parents wont let me use up the ink in our printer. is there another way I can get this paper? I love this stuff. How do you get all this stuff????? I tried to make an origami fortune wookie with a regular piece of paper. Epic fail. Thanks for the paper. mine never prints right ahhhhhhhhhhhhhhhhhhhhhhhhhhhhhhhhhhhhhhhhhhhhhhhhhhhhhhhhhhhhhhhhhhhhhhhhhhhhhhhhhhhhhhhhhhhhhhhhhhhhhhhhhhhhhhhhhhhhhhhhhhhh!!!!!!!!!!!!!!!!!!!!!!!!!!!!!!!!!!!!!!!!!!!!!!!!!!!!!!!!!!!!!!!!!!!!!!!!!!!!!!!!!!!!!!!!!!!!!!!!!!!!!!!!!!!!!!!!!!!!! the best paper folder ever!! !Origami Yoda VS Darth paper!!! !Who will win!? darth papper yoda is soooooooooooooooooooooooooooooooooo old. make one for each cover star! I am going to ask my mom to print this out. My mom siad “i going to print this at work”. Super Stooky! I’m gonna have a wookie at home!!!!!!! What the (Bleep) are you talking about Westcott. A fake Yoda you are, Ermm. Yoda swear not. Yoda imposter you are. Hey I speak for Yoda he isn’t dead. my origami chewbacca prints right!!! 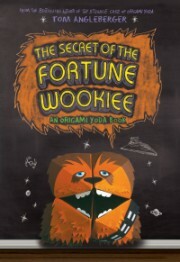 im makeing a new fortune wookie that looks epic! Yoda is so easy bunck. Stooky fold do you want to be friends? So ,he can be ez! My fav is Darth papper but I like yoda too. I hate The fouturen wooky, because I was up all night once trying to make him! I am Dark Yoda’s friend I hate hacker I want to beat the (Bleep) out of them. I really injoy watching the STAR WARS.I seen 1,2,3,4,5,6.I can’t wait for the new three. I am Luke’s older brother he ticks me off! I am a mean green machine (ha ha ha)! By I may never be on this again! never mind my old comment. my wookie paper went through the washer so i’m asking my friend to print me some. 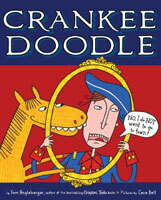 tom angleberger is the best author/doodler to ever write a book!! Hey, Who thinks that Yoda (the one posting) is an imposter. Comment. He’s freinds with Dark Yoda! I figured out how to fold yoda with green and brown paper! MY MOM HAD TO HELP! I cant print it. I get this error. “The RPC server is unavible.” what does that mean? im answering camerons question;i got mine online since i couldnt find it in stores. even though im not tom lol. I love origami yoda!!!!!!! it rocks thanks tom angleberger u rok!!!!!!!!!!!!!!!!!!!!!!!!!! I’ve made a “Mache Windu” finger puppet by converting the 10-fold Darth Paper. How did you create that, what software Tom? I have all of your books, except Jabba. I can’t wait until it comes out! I have not been able to answer all the letters yet. But I will be on the lookout for yours now! What kind of paper did the mailed ones come on? pssssssss/ i won’t hate this eroart. please of a dead line this is. The world is out of cannons. Send more help! Send more help! WANT TO SUBMIT YOUR PICTURES TO ORIGAMIYODA.COM? Email them to me as attached jpegs. (Start an email, click "attach" or a picture of a paper clip, select the pictures you want to send.) try to send all of your pictures in one email if possible. If you've done that already... Thanks! Give Webmaster Sam 10 days to get them up. If he doesn't, send him an email at sam@origamiyoda.com and tell him to get busy! WANT TO WRITE ME A LETTER? Emails are much much faster, but if you don't mind waiting, I'd love to get your letter! send it to: Origami Yoda, Amulet Books, 115 W. 18th St., New York, NY 10011. PLEASE PLEASE PLEASE include an extra envelope with your address on it, so I can answer your letter. WANT TO COMPLAIN ABOUT STAR WARS? I've got my fingers in my ears and I'm saying LALALALA really loud! HOW TO SUBMIT PHOTOS TO THIS SITE! WebMaster Sam works very hard to run this Website. You can make things a lot easier for him by doing these things…. 1) Get the best photo you can. Take it outside in good light if possible. Make sure it is rotated properly. 2) FOLLOW THE RULES for submitting pictures! People who do not follow the rules will begin getting a CANNED REPONSE sending them back to this page! —->All photos must be Jpegs. ———->The subject of your email should be a clear, properly spelled, properly captialized description of what you are sending: example: SuperFolder Tom’s Origami Walrus-Man! 3) If you have a bunch of origami to share, save it up and put it all in one email please. It’s much faster for me to make 1 post with 7 pictures instead of 7 posts with 1 picture. The new site is UP!!! The first(?) 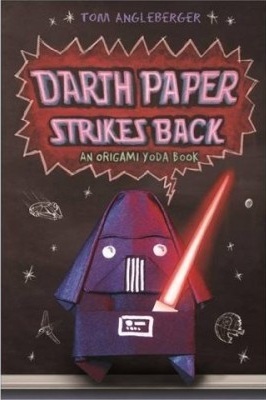 “cover” for Origami Yoda? I hope none of you have terrible summer jobs… like this one. The Rebellion Begins Soon! Final Jabba sneak peek! Another trip down Memory Lane! 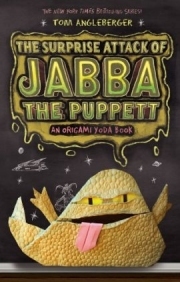 Win a Jabba prize pack from Recorded Books! Virginia stop added to Jabba launch tour! Jabba sneak peek: And Kellen’s puppet is…. Sometimes even I get a drawing right! SF Wyatt and Guillain’s Ewok! Jabba spotted in the wild ! Should book 5 be a … Romance novel? SF Robby’s Origami National Pokedex of Pokemon! Don’t Use the R-WORD! Click for more info! 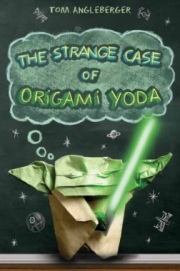 ***Origami Yoda: The Series! 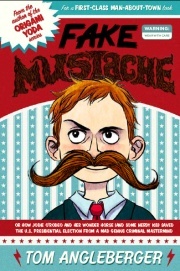 *** Reader-made movie of the book! OY Expanded Univese Fan Fiction Site!!!!!! Incedible collection of stories written by readers! SF DeAnte's site with: Ask Yoda! This website is operated by Tom Angleberger. It is not hosted, operated, endorsed, sponsored by, or affiliated with, Lucasfilm Ltd., or any of its affiliates.